But the highlight of the weekend was the picnic lunch. You see, by a very happy coincidence, the Curleys, longtime friends of ours, were on a five-week motoring tour of the East Coast (they actually live in California) and happened to be passing through Harrisburg during the weekend of the convention. Naturally, we arranged to meet for lunch. However, since this convention was held at a gigantic agricultural center, nowhere near any restaurants, it was obviously going to have to be a picnic lunch. I thought, “Okay, a picnic, easy.” Right? Well . . . sometimes. Here’s the scenario. The convention is on Friday and Saturday, and the lunch will be on the second day. On Thursday evening, we will be driving out to Harrisburg. All the food will have to be prepared on Wednesday and Thursday morning. So, what picnic foods can you make that will be able to sit for two, or possibly three, days and still taste delicious at the end? I don’t know about you, but I make these tarts. 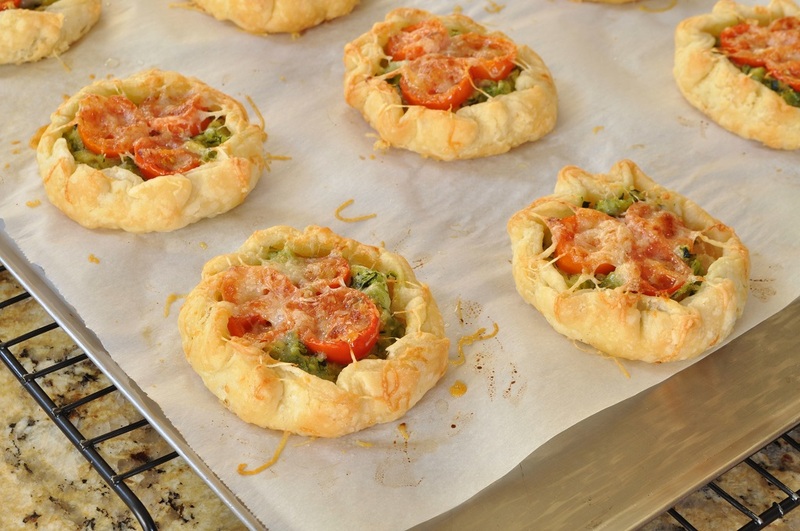 I like to call them farmhouse tarts, but they’re really individual vegetable-and-cheese galettes. You eat them with your hands, and they can sit at room temperature for several days without any apparent loss of flavour or texture, although the crust may soften a bit. But it still will be flaky and buttery and utterly scrumptious. 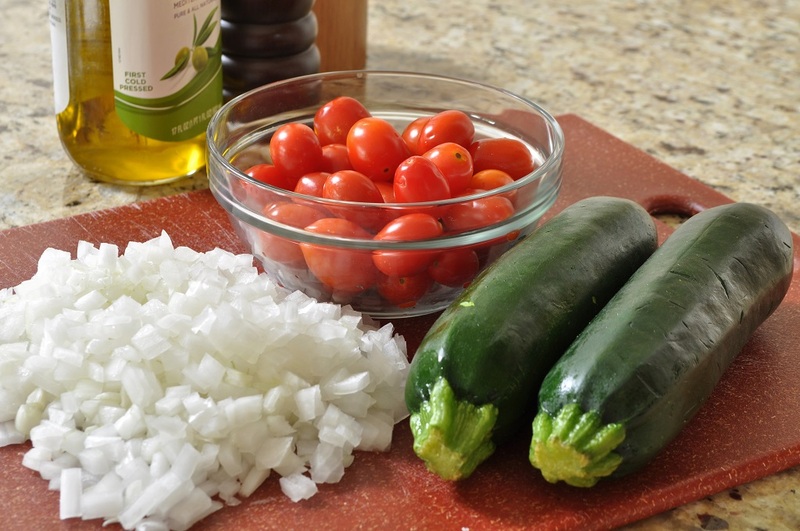 My usual filling is, in order of application: parmesan cheese, sautéed onion, grated zucchini, sliced cherry tomatoes, a light brush of olive oil, and a final pinch of cheese. But you could choose any combination of cheese and vegetables that you liked—or just use whatever odds and ends you have kicking around in the vegetable bin of your refrigerator. However, I like how the green of the zucchini and the red of the tomato look together, and onion, of course, makes everything taste better. 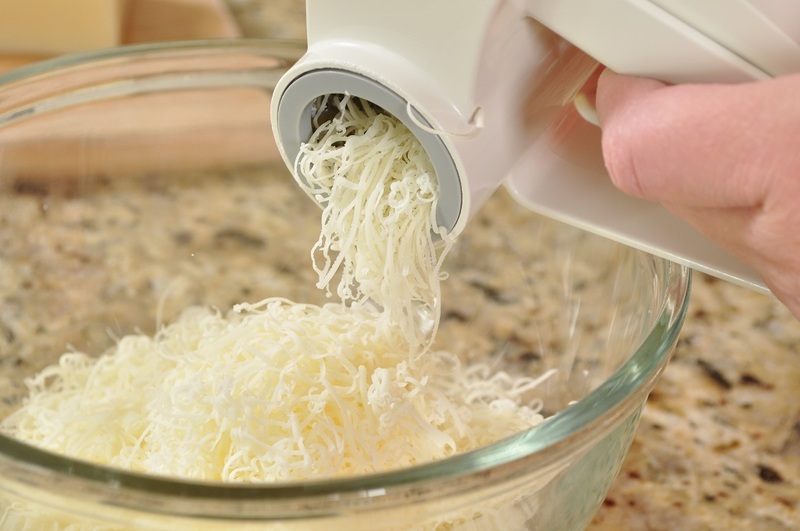 As for the cheese, parmesan and gruyere are my favourites, but don’t think that only hard, grating cheeses will work. I’ve also used crumbles of goat cheese and shredded mozzarella with great success. 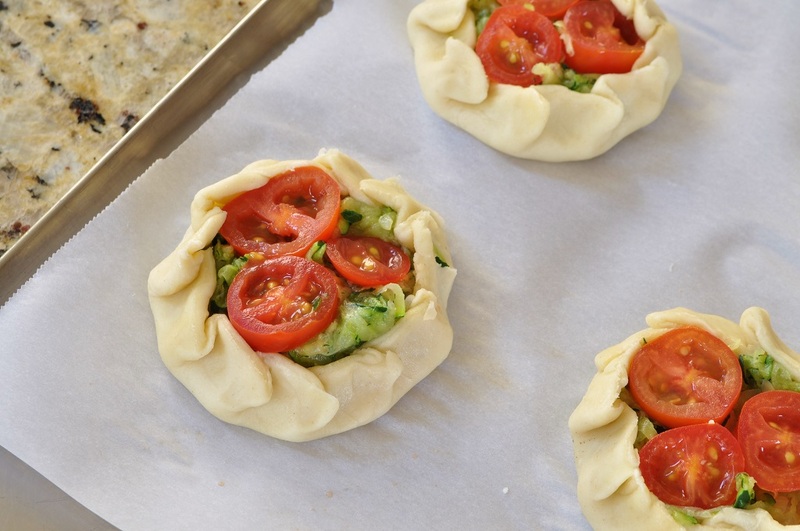 The important step is to sweat the vegetables separately before assembling the tarts, to evaporate some of the water. That way, when you bake the tarts, the vegetables don’t release a lot of liquid and make the crust soggy. 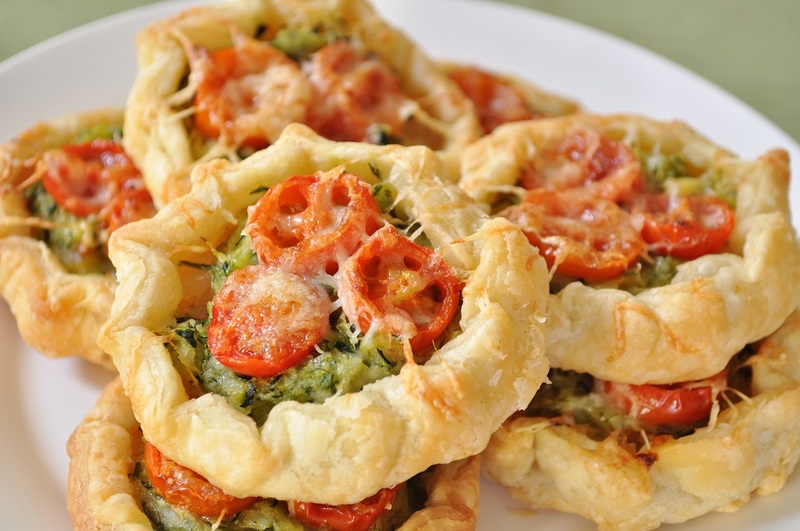 But when you take the time to pre-cook your vegetables, you are rewarded with beautiful, crisp golden shells, which are really what these tarts are all about. These tarts are my submission for this month’s Tea Time Treats challenge, organized by Karen of Lavender and Lovage and Jane of The Hedgecombers. This month Jane is hosting and the theme is open top tarts, pies, and quiches. Note: You’ll notice that I don’t call for pre-cooking the tomatoes, although they do contain a lot of water. But with only a few slices sitting on top, the heat of the oven will evaporate the water quickly enough to prevent soggy crusts. Make the tart dough first. Combine the flour and salt in a bowl, and then toss in the cubed butter. Use your fingers to work the butter into the flour until hazelnut-sized pieces remain. Stir in just enough water to make the dough come together. Turn the dough onto the counter and shape it into a 1-inch thick disc. Wrap the disc of dough in plastic wrap and rest in the refrigerator for a minimum of 1 hour. Four hours is the ideal resting time. At this point the dough may be kept in the refrigerator for two days, or stored in the freezer for six months. If the dough has been stored in the freezer, defrost it overnight in the refrigerator before using it. While the dough is chilling, prep the ingredients for the filling. Heat a dollop of olive oil in a sauté pan and cook the onions slowly over low heat until they are just beginning to turn gold on the edges, about 15 minutes. Season with salt and pepper, and then transfer to a bowl and set aside to cool. 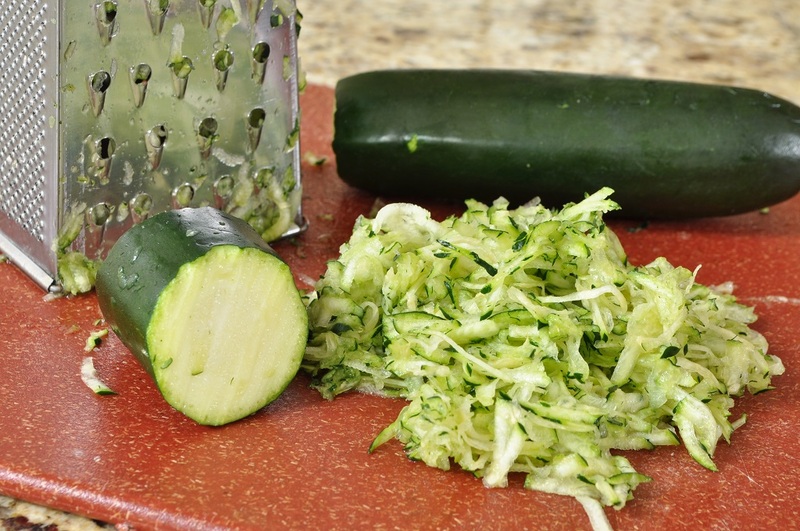 Coarsely grate the zucchini (don’t bother peeling them) and then gather up big handfuls of the shreds and squeeze as much water out of them as you can. Heat another dollop of olive oil in the sauté pan over medium heat and sweat the zucchini just until it is tender, stirring occasionally. Season with salt and pepper and then set aside to cool. Once the zucchini has cooled enough to handle, place it in a colander and once again take handfuls of it and squeeze out the water. If you don’t want to use your hands, you could also place it in a piece of cheesecloth and then twist the ends of the cloth in opposite directions to squeeze out the liquid. 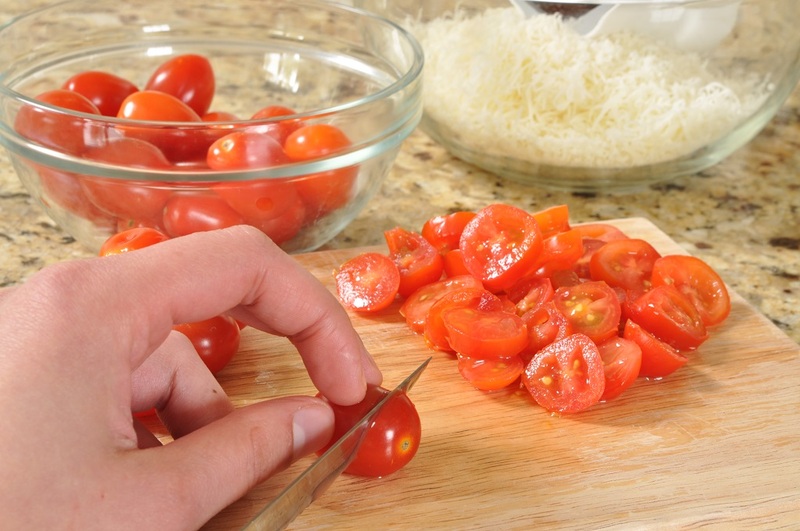 Slice each cherry tomato into 3 or 4 slices. Now you are ready to start assembling the tarts. 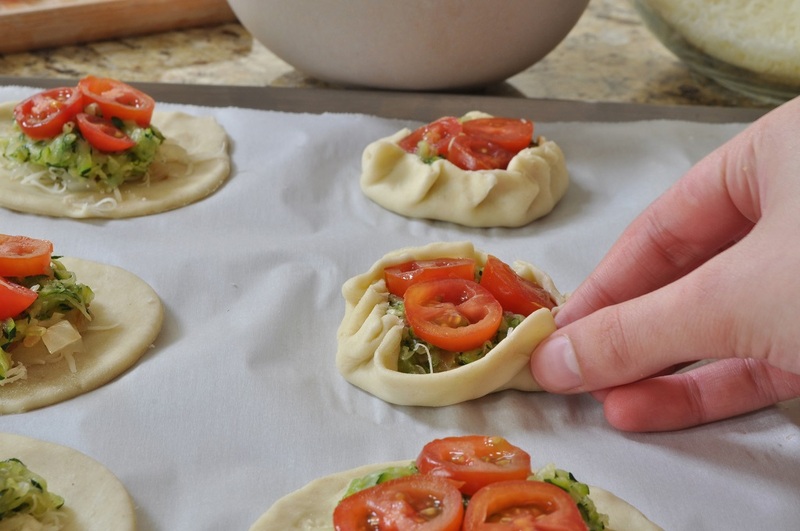 Remove the disc of dough from the refrigerator and unwrap it. Place it on a lightly floured surface and flatten slightly with a rolling pin. Then roll out the dough into a circle ⅛-inch thick, rotating it a quarter turn after every few passes of the rolling pin to help prevent sticking. 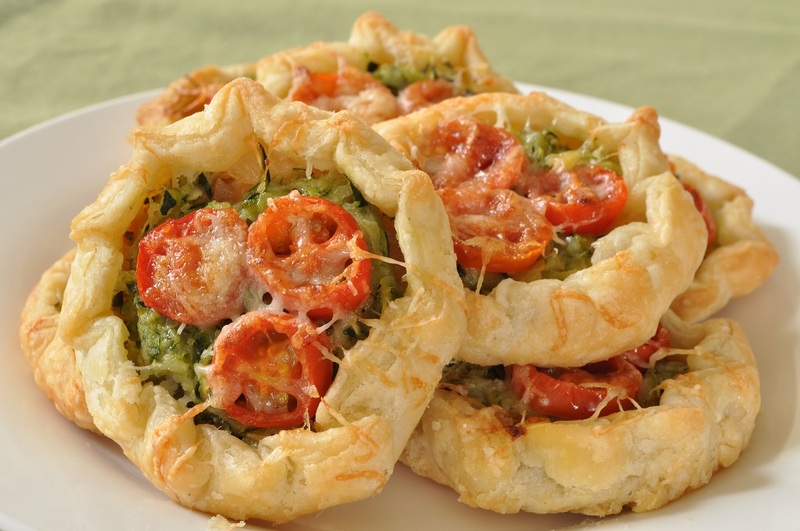 Using a 4-inch round cookie cutter, cut the dough into circles, brushing off any excess flour. Stack any dough scraps back together—don’t roll them into a ball—and chill thoroughly before re-rolling them and cutting into rounds. You should get about 16 rounds of dough in all. Line two sheet pans with parchment paper and evenly space the dough rounds on them. 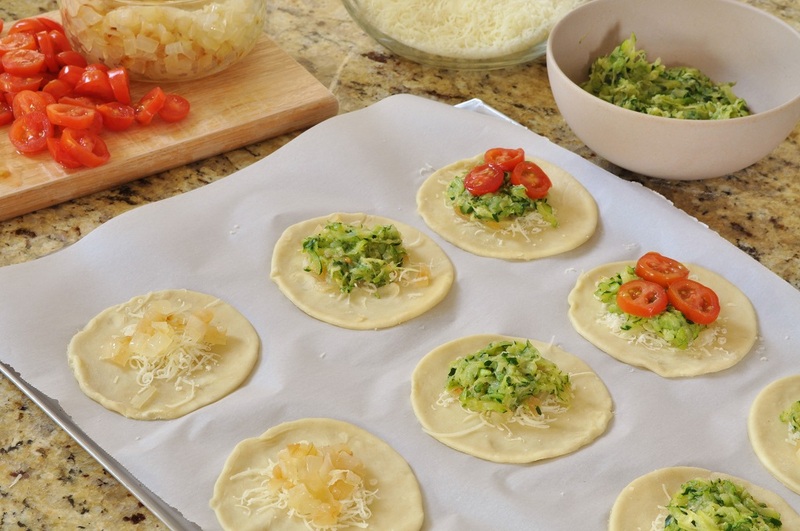 Sprinkle each round with a generous pinch of parmesan cheese, leaving a ½-inch border around the edge. 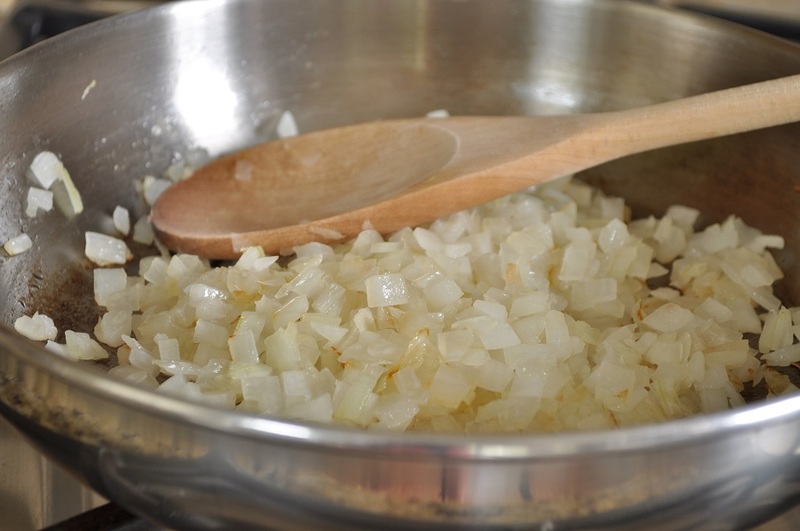 Place a scant tablespoon of the sautéed onions in the center of each round. Mound a heaping tablespoon of the shredded zucchini over the onions and arrange the slices from one cherry tomato over the zucchini on each tart. 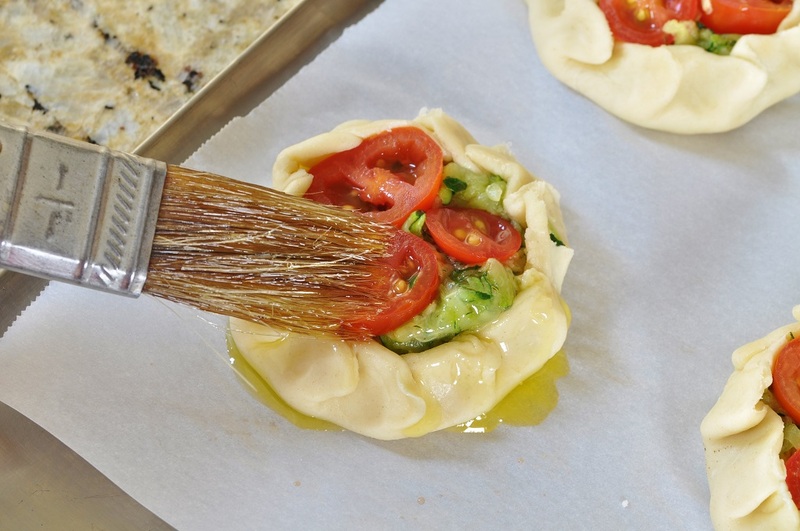 Fold up the edges of dough over the filling, pleating it as you work your way around. 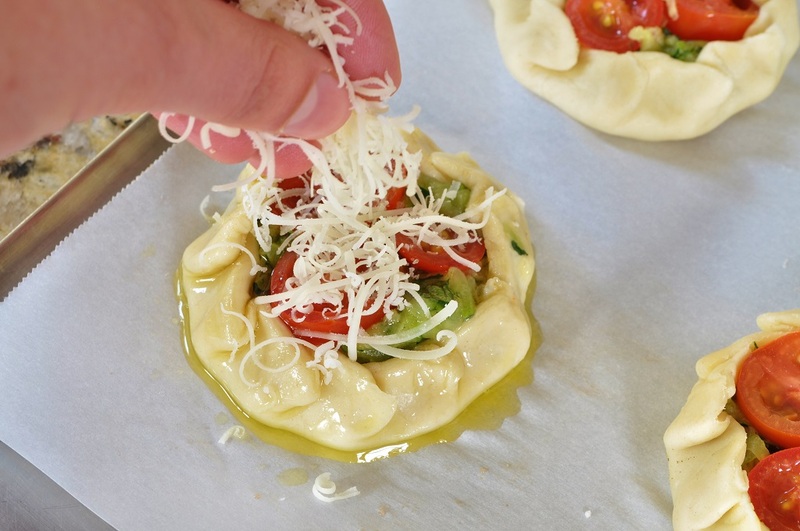 Brush the shaped tarts with olive oil and sprinkle with another generous pinch of parmesan cheese. Bake the tarts, one sheet at a time, until the crust is golden and the bottoms of the tarts are crisp, 20-25 minutes. Keep the second sheet of tarts in the refrigerator while the first one is baking, so the butter in the tart dough doesn’t melt. Once the tarts are finished baking, immediately transfer them to a wire rack to cool. Gorgeous looking tarts, perfect picnic food. Thank you, Julie. This is the time of year–warm, but not sweltering yet–where I want to eat outside all the time! Absolutely beautiful! Really delicate and I bet they taste delish! 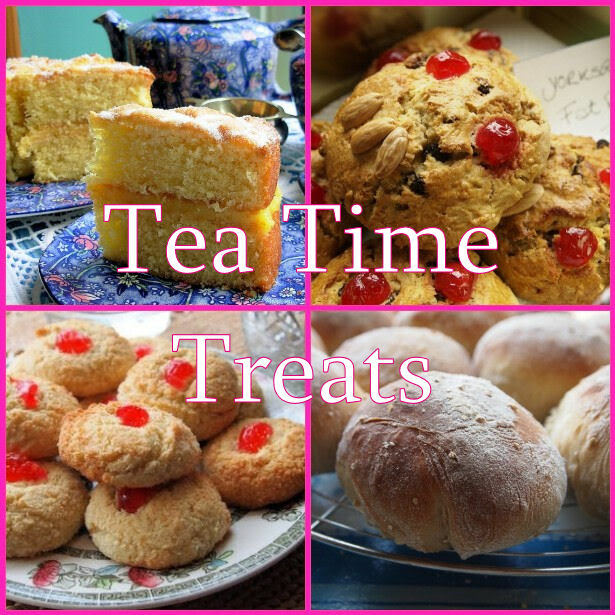 Thanks so much for taking the time to enter them into this months Tea Time Treats! Actually, between homeschooling conventions and working on my cookbook, I barely managed to squeeze in the post. But I’m glad I did! I would have hated to miss Tea Time Treats. Quite honestly, if given the choice between a dessert and these tarts, I would probably pick the tarts–and I am definitely a girl with a sweet tooth!